A South Jersey woman continued the region's recent run of success on game shows. 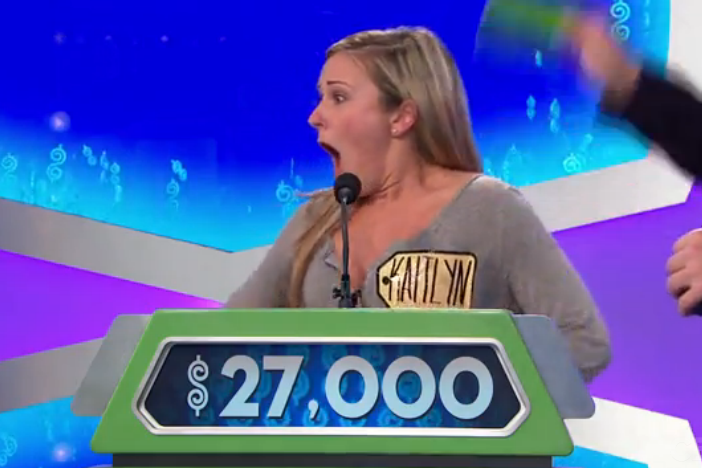 Kaitlyn Schoeffel, from Egg Harbor Township, was selected as a contestant on an episode of "The Price is Right" that aired Tuesday. Despite walking away as the "Showcase Showdown" winner, the beauty queen contestant was able to keep her victory a secret from her family, the Press of Atlantic City reports. Schoeffel's luck began at the very beginning of the November taping as she was the first person announced to join "Contestant's Row." After early struggles, Schoeffel earned her way on stage with host Drew Carey by successfully bidding on a laptop. She also won $5,000 playing the pricing game "Punch-A-Bunch" and advanced past the "Big Wheel." She wasn't satisfied just yet and she capped off her impressive showing with a win in the "Showcase Showdown." Presented with prize package comprised of a trip to Argentina, tango lessons and a boat, Schoeffel guessed with $400 of the actual retail price of $27,376. "She managed to keep her participation on the show a secret from her family. Schoeffel lured them together on Tuesday, when the episode aired, to a TV under the guise of lunch with her. Family members were shocked not only by seeing Schoeffel on the show, but to see her success." Schoeffel also told the outlet she will be competing for the title of Miss New Jersey this summer. You can watch the episode on the CBS website.